The Victorian Parliament has 18 more sitting days before it is prorogued to end one of its most dysfunctional periods of government. 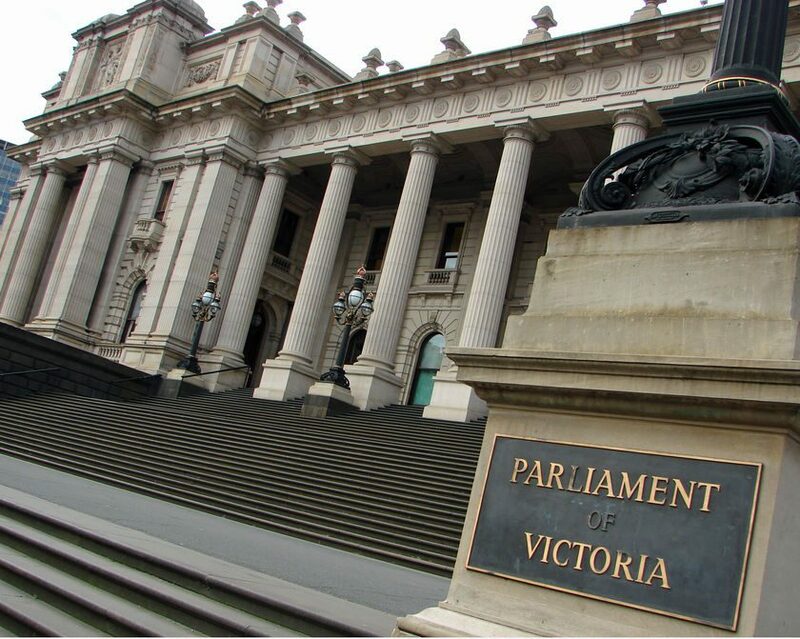 The Victorian Parliament’s last sitting day of October 16 will then see the government move into the mandatory six weeks purdah period before the designated election on November 29. Three sitting weeks in June and August, or nine days, will be without the disruptive suspended independent member Geoff Shaw who has been principally the instigator of this dysfunctional period. He holds the balance of power and is set to return on September 2 when parliament resumes for two weeks in September and the final week of sitting starting on October 14. It will be during this period that the parliament will either be able to deal with many of the infrastructure bills and other regulatory and legislative matters that the Coalition government wants signed off, or Victoria faces another destabilising period. The State does not need the latter. Politicians and their Party administrations need to ensure that they are there for the advancement of the State, not for personal headlines or egos that appeal to minorities and don’t make a significant contribution to the development of the State, or go towards achieving a vision for the State. This is also the period in which private sector needs to put its cases to all political parties to get them either incorporated into election policies or have them addressed before the purdah period. In the health sector, the government is looking at outsourcing many of its functions to the private sector, in the agriculture sector they are looking to expand trade into Asia as well as enhance local processing, in the mining sector they want to highlight the significance to the State to the future opportunities, including a direction on future onshore exploration, in the manufacturing sector they are looking at every opportunity to attract new industries and grow jobs. Transport, health, education, law and order are key functionary elements that the community expect, but they are not visionary. They are necessities that governments must ensure they plan and manage well. This is not to say that the parties could not turn education or health (medical research and best practice) into a vision for the state with a bit of thought! However, the window for the private sector to act is narrowing. They must act now! All parties will be running functions to meet with Leaders, Ministers, Shadow Ministers and candidates. All are important to you in the information process, but you must ensure that your case addresses the current policies of all the parties, or seek to influence these policies. If you are going down this path and want expertise counsel, talk with us. Experience and knowledge are the basis of our practice. The recent, almost contradictory, leaked emails from Fairfax Newspapers CEO Greg Hywood suggest, on closer analysis, that the once proud mastheads of The Age and the Sydney Morning Herald are at least headed out of print some time in the near future or at worst, headed for the scrap heap. A quick unpacking of those two statements show that perhaps they can be reconciled if one adds the fact that 100% of Fairfax revenues have taken a major dive over the past few years and they own a bucket-load of regional, rural and suburban titles but their two Australian flagships continue to bleed. To this observer it would appear that Fairfax have made at least a couple of strategic errors. First, they assume they can turn the digital editions of their two leading mastheads into profitable businesses. They are very far from that objective and not really showing any meaningful progress. Second, they thought the answer to their falling readerships was to become the ‘anti-Rupert’. News Ltd’s tabloids are known to be right-of-centre and a platform for their owner’s political leanings (or interests more like – but that has always been the case with any media organisation dominated by a founder or family). Fairfax seem to have figured that they should move to the left in pursuit of the alternate ‘progressive’ readership and jettison balanced, factual reporting for speculative, assertive, cause-and-opinion-based journalism. Problem is they forget that Rupert has spent decades turning his tabloids (and let’s remember that the term is a synonym for not a very serious paper) into sports and social reporting organs first, with a modicum of daily news thrown in to bolster the Opinion Pieces. Everyone knows that’s what you get. The Editors of the daily News Ltd tabloids know only too well their readers mostly read the paper from the back first. The Age and the SMH used to be positioned as serious broadsheets with in depth analysis and comprehensive impartial coverage of local, national and world affairs. So exactly how did they figure that becoming tabloid ‘red-rags’ was going to work? Slavish following of any one party line by a “serious newspaper” is ultimately self-destructive – it’s unbalanced and alienates readers. The tabloids however can thrive on it. You may ask why are not the left leaning or ‘progressive’ readers not scooping up copies of the hyper –current-government – critical new Fairfax productions? Perhaps they are overrepresented in the ranks of the media listeners, watchers and readers who seek their news from many diverse and various sources, i.e. 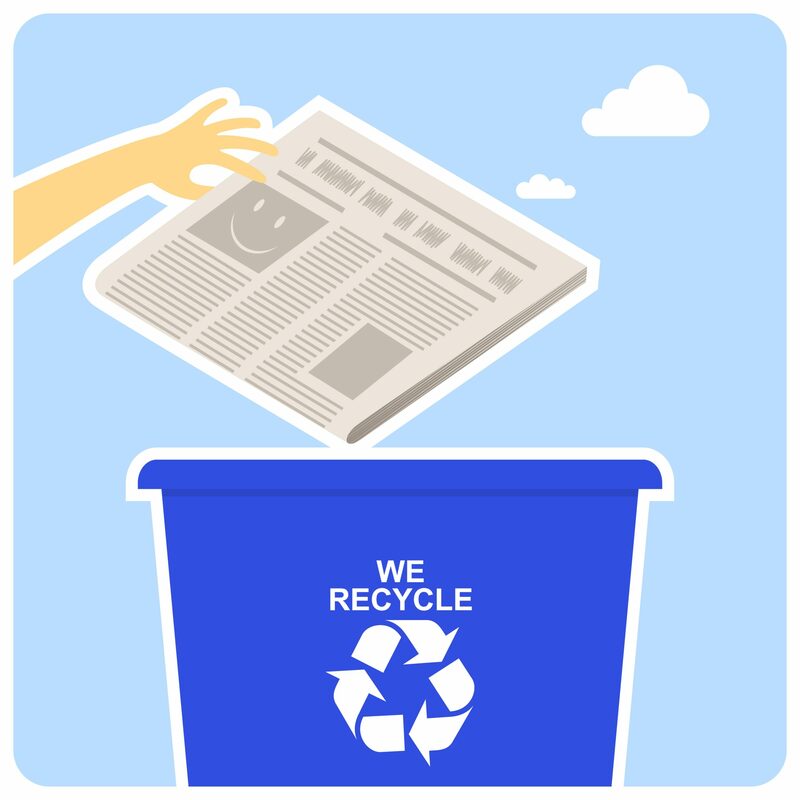 online, through social media and the plethora of other ways ‘news’ can be consumed today. Perhaps they haven’t formed the lifelong purchase habits of their more conservative, more working class brethren – or perhaps they just don’t feel the need to put their money where their mouth is. One thing is for certain, News Ltd, for better or worse, knows how to get their readers in and keep them. And if it is sport as religion that does it, so be it. On any analysis the picture is not good for Fairfax. Each time I pass the glittering, but abandoned Age print factory in Tullamarine on the way to the airport, I reflect on the imminent demise of another once great brand that totally missed the new technology revolution, which ironically they reported on. A little while ago that larrikin businessman John Singleton flirted with buying Fairfax’s radio assets and he was arrogantly ignored and dismissed. His blast in return (as reported in The Australian) is not only vintage Singo but also great to see as an example of what people really think when the mask of corporate civility is removed. Singo made his views clear on the future of the Australian Financial Review, I’m willing to put money (not a lot, mind you) on The Age and SMH not lasting another 18 months in print or perhaps any form. That would be a sad outcome. 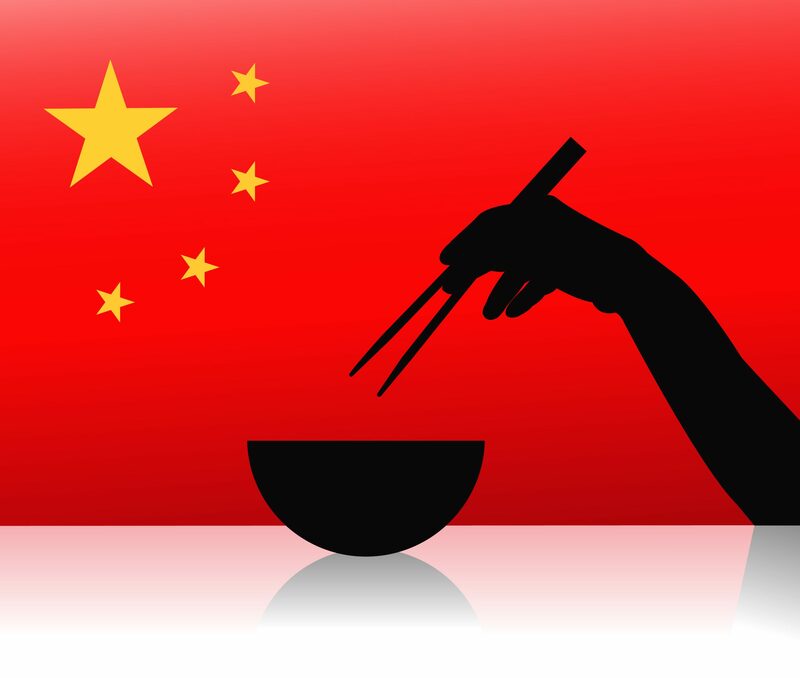 It is hard to believe that the consumer class emerging from Mumbai to Shanghai will reach 3 billion people by 2030. That is a lot of mouths to feed! Australian governments across the board have identified primary producers as being exceptionally well placed to capitalise on this dynamic in the markets to our north. But what is the most valuable role that government can play from here on out? 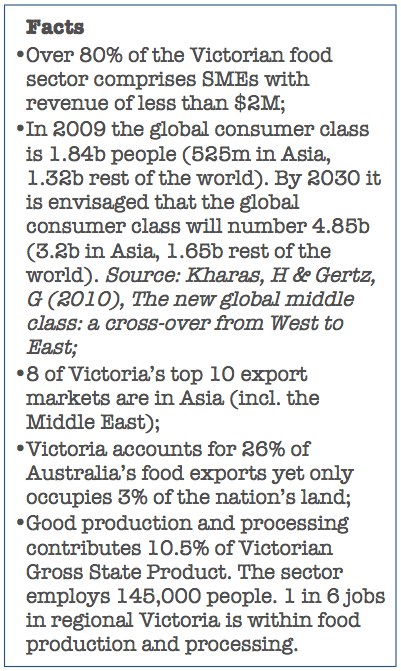 More specifically, Victoria has Food and Fibre Marketing Co-operatives Grants ($5M over 4 years), the Growing Food and Fibre Initiative ($124M over 8 years), an International Engagement Strategy ($50M over 4 years), and the Food to Asia Action Plan. What we know on the ground is that it is extremely time consuming and expensive for Australian food and fibre producers to establish a sustainable foothold in new offshore markets. Especially where there are substantial cultural differences to be negotiated. It is here that there is an apparent disconnect between policy settings and achieving aspirational goals for our farmers. About the only Australian entities that can tough it out establishing new markets are the big players who are doing it anyway. The challenge therefore is to focus on action that pulls our mid-tier and smaller primary producers into the exporting mix. These are the businesses that are unlikely to have the resources, or the inclination to dig deep into their pockets and spend considerable time away from their enterprises to make the most of this evolving landscape and government encouragement. They also produce some of the nation’s most sought after products. We are of the view that there are plenty of activities that could be undertaken to make it worthwhile for our more boutique and niche suppliers to join this potential gold rush; such as national/state/sectoral branding, educational and cultural exchange, international office and secretarial support, and an event schedule that includes regional showcases of what Australian farmers have to offer the world. A lot of the big picture work has already been carried out. It is now time to create an environment that sees our primary producers making the most of government policy and international infrastructure to truly incentivise them to take their products to the world. We see taking this action as translating the bigger picture into stronger regional communities, more employment, and more profitable and innovative businesses. This makes both economic and political sense. As Andrew “Twiggy” Forrest recently observed, we need a “Team Australia” and access to expertise can help deliver on these aspirations. In a Victorian context we think that the simplest place to start would be to develop a “road map” for our primary producers that illuminates the path to market. Such a tool could, and should, be taken to our regions to highlight the opportunities and support that exist; as well as demystify the exporting process for those who are not doing it. By increasing the number and diversity of Victorian enterprises exporting, we will see these excellent policies deliver maximum benefit to the State. Of course this is only the first play in what will be a long and beneficial game. There is plenty more work to be done with one of the major challenges on the government side being to translate theory into practice. Angus Nicholls has a depth of experience in both the political and commercial worlds. Over a 15-year career, Angus has been a senior government policy advisor at Federal level, a Councillor at Local government level and the General Manager of one of Australia’s largest seafood businesses. He has developed a detailed understanding of primary produce, agricultural and industry policy at all levels of government and a deep understanding of local government planning, environmental and community amenity issues. He is now a Senior Associate and the strategic communications firm Robert Masters & Associates.